Yay, we made it to Wednesday…..and it’s almost October! The best month of all months. Peace. Beautiful art Laura. Sometimes the leaves leave their best till the very last as the colour fades. Keep a look out for Japanese Maple leaves if their are any around. Better still hop on a plane in mid November and fly to Kyoto Japan and collect an encyclopaedia of leaves for a marathon art display. Bootiful! ( in honor of almost October). Haha! Thanks, Catherine! Loved your abstract painting that your husband is buying, but was unable to comment on it. Looks wonderful! The seasonal change provides such simple beauty. 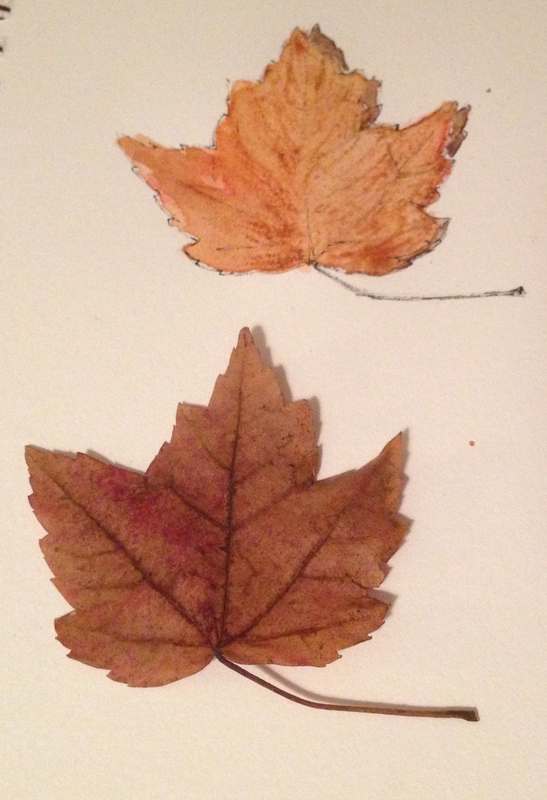 Your leaf paintings are exquisite, Laura. Another beautiful leaf! Does it get easier now to paint a leaf now that you’ve done a few? A little, Kari, and thank you. I think it gets easier to draw them, but the colors are getting more vibrant and harder to match! I bet! I love it when the colors are all marbled! Isn’t it great? 😀 Thank you! This is quite the discipline, this leaf drawing. Maybe I’ll give it a try tonight. I’m starting to see them on the ground. Thanks for the the inspiration! You’re welcome! I’m looking forward to your work! I’m glad you’re enjoying these. Thank you, Jill, and same to you! I hope you do paint one; I’d love to see it! It totally is!!! Thank you! And totally agree with you on October. Seriously one of the best months (minus all the creepy movies and things that come out). If we could have a year of Octobers and Novembers, my soul would be in heaven. Right?! This is me too! 😀 Just the smells alone seal the deal! Not to mention the weather and colors! Great leaf! And I like October too. So much so I decided to get married in October. It’s a great month! 😀 Happy Anniversary, Carol!